Hi Mums and Dads, I am offering nannying, babysitting and tutoring services to local families if you are at all looking for assistance. I have 8+ years of experience and a love for kids and ensuring they are well cared for when their parents aren’t around, having had a nanny growing up. I would love to help your family! I am responsible, trustworthy and mature. I am happy to come for a trial if that would be of help. I have been babysitting for the past 6 years for many families with kids from 4months-13 years of age with a range of personalities. I have looked after one family for the past 2 years, 3 afternoons a week. They have 3 children under 6 years of age. I cook, clean, feed and bath the kids as well as help with reading, homework and whatever else needs to be done. I have experience with newborns and both boys and girls. 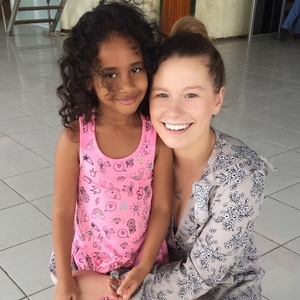 I have done some tutoring in the past and do a lot of work on education in East Timor. I am familiar with the syllabus and have an extensive knowledge of teaching methods and children’s brain patterns and drivers. "Ornella has babysat my two girls on a few occasions. She is nothing but exceptional. My youngest felt unwell after l left for work. Ornella applied a few home remedies that were simple & not harmful that helped to ease my daughter's symptoms. She stayed with her past the agreed time of babysitting, until her father came to pick her up. She speaks well, very punctual & polite. She went above & beyond. Great babysitter!!!!"